Kitchener, ON – December 2, 2018 – The Ontario Association of Food Banks (OAFB) is set to release the 2018 Hunger Report on December 3. The annual report provides an in-depth look at food insecurity and food bank usage in Ontario, as well as look at future trends. In Waterloo Region, there is a consistent need for food assistance. The reality is hunger is on every street, in every neighborhood and community. Hunger can impact anyone, at any time. Below is a snapshot representing the total number of household visits to food assistance programs in Waterloo Region in 2017. Total number of household visits to food assistance programs in Waterloo Region in 2017. Scale for the heat map – shows low to highest density. “The need for food assistance remains consistent,” said Wendi Campbell, CEO The Food Bank of Waterloo Region. “The data is telling us that people access food support as a short-term solution, however the support is always available for those who need it. Thirty-six percent of households that accessed food assistance in 2016 are no longer accessing food assistance which represents 4,700 households and over 9,400 individuals. In 2017, there were 4,100 new families that accessed food support for the first time.” added Campbell. Campbell explains that food banks and related programs are valuable and provide the individuals accessing hunger-relief programs with varying degrees of support, from short-term to more sustained assistance. The 2018 Hunger Report highlighted that in Ontario, single person households and children remain the two largest groups of food bank users in the province, with the number of seniors accessing hunger-relief services increasing more than 10 percent over the previous year. 35% of individuals that accessed food assistance were under the age of 18. 4% of individuals who access food banks are seniors, with 11% of them accessing emergency food hampers 12+ times a year. “We are a fairly young community – with a median age of 38.5 – but as the baby boomers enter the 65+ age category, we may start to see an increase in the number of seniors accessing food assistance programs,” explained Campbell. According to the 2018 Hunger Report, over 12% of Canadians over the age of 65 fall below the low income measure. An estimated 32% of Canadians between the 45-65 years of age have nothing saved for retirement. 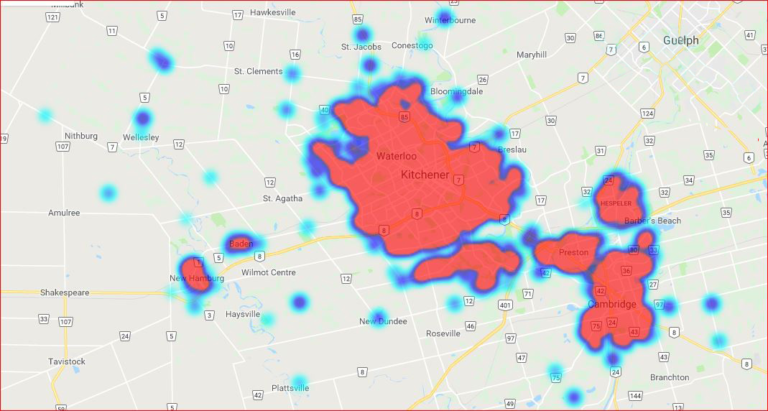 Each year, members of the Community Food Assistance Network – led by The Food Bank of Waterloo Region and the Cambridge Self-Help Food Bank – participate in a national survey providing important data that is used to better understand food insecurity in our province and communities.